Excellent service. No high pressure sales and very knowledgeable. The installers were professional and timely. Floor was installed as promised and although trim was not in stock and shipment delayed, it was installed immediately when received. Other's that used the advertised discounted floor company around the same time experienced numerous problems and delays. 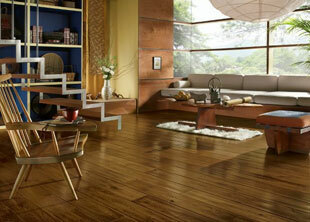 Hardwood Floor Specialists is Orange County's number one choice for sanding and refinishing hardwood and wood floors. A good finish is important to maintain because it keeps your floor looking great and helps prevent damage such as watermarks and scratches. As an added benefit, sanding and refinishing can make it easier to clean your floor and help eliminate extra maintenance in the future. Overall, sanding and refinishing is a great way to help you protect your investment. Our expert sanding process involves a dustless system, which minimizes dust production and protects the property in your home or business. As always, we treat our clients' homes and businesses as respectfully as we treat our own showroom, covering all exposed cabinets and furniture with plastic covers during sanding and refinishing projects. When sanding is not required, we can screen and recoat your wood or hardwood floor to restore its original beauty. Our expert staff can help you choose the perfect stain color and sheen level for your decor. Call Hardwood Floor Specialists today. We can refinish any wood or hardwood floor or staircase.